Dwarves are the master manipulators of stone and iron. Their forges burn with the intense heat needed to smelt and refine ores to produce the finest craftsmanship in Illyriad. Their cities are legendarily detailed and beautiful; it is indeed true that it is often impossible to see a joint between the carefully laid stone blocks that make up their city walls. 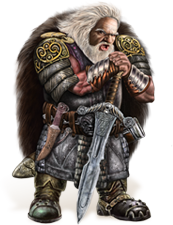 Dwarves are a strong choice for those who want to rely on their defensive game, although they are also the master creators of the massive siege engines for demolishing an opponent's city. t the start of everything was the Maker. First he made tools for his use. These are called Artefores, with which he made all that now is. At the Maker's direction, the first Artefores crafted stone and clay and earth and metal and all that is hard. Then the next Artefores crafted water and light and fire and all that is soft. The third Artefores made from the hard and the soft all that grows and thrives, the plants and the animals. Then last, that some of the beasts might think and live, the last Artefores crafted all that cannot be seen or touched, such as time and distance, mathematics and language, and death. With the invisible things and the living things, then the Maker's Artefores constructed their most complex creations, the races who now rule the world. First they made Orcs, which they saw were deficient, being misshapen and brutish, too like a simple animal, too full of base urges. Then they made Humans, which did not satisfy them, since this race was unskilled and often unreasonable. These first two races they cast out into the wilderness, to live with the beasts, and there these two began to fight together like beasts. Then at last they made the Dwarves, and they were pleased with what they had made, this race being solid in proportion, skilled with tools, sharp of mind, stable in temperament. After that they made other races, as a craftsman might make oddities for his amusement, such as Halflings, Kobolds, Elves, Ogres, Centaurs, Lizardfolk, and such. This was the First Age. It was a great age for the Dwarves. It was a golden age, an iron age, a marble age, and age when our people learned from the Artefores and grew in strength and craft. While on the plains and in the forests below our peaks the outside world was filled with snarling beats and warlike Orcs and other chaotic jumble, the Dwarven halls were bastions of order and progress. Under the tutelage of the Artefores, Dwarves were responsible for all of the greatest inventions the world has ever seen, first fire, then the crafting of iron, through to winches and pulleys, hydraulic pumps, and machines more complex than any that we know now: mechanical warriors, great mechanized kitchens and workshops, even machines which flew. Over the Dwarven halls ruled a single King, who wore the Eternal Crown, crafted from iron by the Artefores themselves. It was said that if the Dwarves stayed on the path that the Maker had set for them, the crown could not rust or be broken and our bastions could never be breached. Beneath him were well ordered guilds of craftsmen, regiments of soldiers, schools of wizardly scholars. We grew in understanding every day, and remained safe from the world. But armed with their great machines and inventions, Dwarves began to investigate their own paths, to leave the well ordered halls, to abandon the teachings of the Artefores. The Artefores withdrew from our halls, and left us only with the priests who now tend their scrolls.